Develop the confidence you need to take on and master life’s difficulties and challenges. Sometimes everyone feels like they are not up to a task. Often all you need is the mindset to try a new activity or to take on a new responsibility, and then you adapt and learn as you progress. But what about when you have trouble making that first step? To find your confidence again and return to a positive mindset book an initial consultation at my expense. Some people argue that confidence is a trick and it’s all about acting like you know and giving things a go. However at certain points in your life it is possible for circumstances to take your confidence leaving you indecisive and unsure of what next steps to take in life. How does Hypnotherapy help restore confidence? Understand the nature of confidence and how being sure of one’s self isn’t always about unshakable determination, but rather an attitude of being prepared to attempt things and give them a go. Create a pattern and process that allows you to start taking small steps towards your goals without having to worry about the reasons you might have failed in the past. Develop a positive mindset – move from wondering “what’s the worst that could happen” and start thinking “what’s the best that could happen” – flip your thoughts and discover a world of possibilities. Beat fear and anxiety, silencing the personal critic and internal influences that may have stopped us on our journey of progress in the past. Having a good level of personal confidence helps out in every area of your life. Fortunately however, once you have started to see progress and success overcoming a specific challenge, the experience allows you to take use this mindset tackling new difficulties. 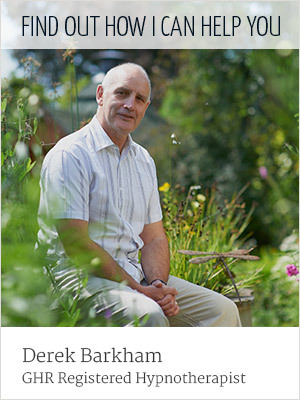 Derek Barkham is a fully BABCP accredited psychological therapist with years of experience working with the NHS, giving you access to a lifetime’s knowledge of helping people gain the moment to take that vital next step in their life.